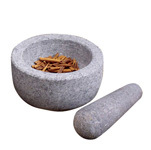 Dual mortar and pestle sets are carved from granite, and offer a wide variety of uses. The mortar base can be used on both sides (one shallow, one deep) offering just the right amount of depth and space for different purposes. 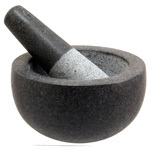 The pestle also has two sides for adaptability. GraniteÕs heavy weight provides the ultimate control - this hard wearing stone will last for generations to come. 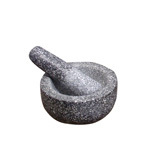 The mortar & pestle has been used for centuries to grind and blend herbs and spices. 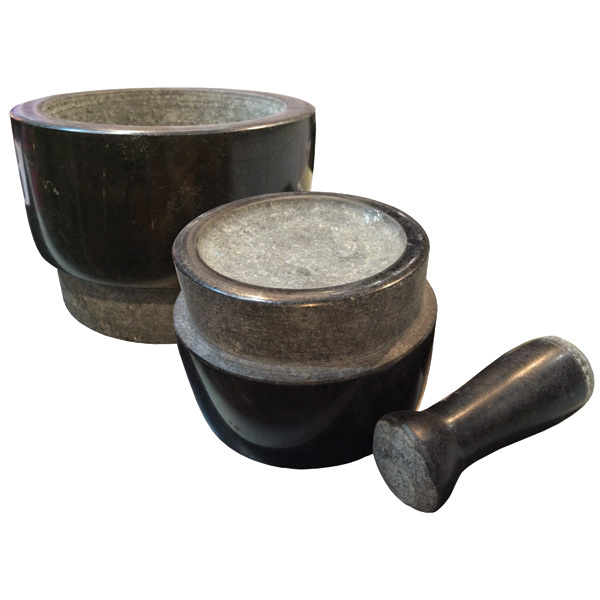 Pesto is a great example of sauce traditionally made with a mortar and pestle, and while many people make pesto using a food processor, a mortar and pestle is highly recommended. The flavours that pesto is so famous for are carried in oils present in the herbs and nuts; those oils are released by pressing, which sharp blades are very poor at.